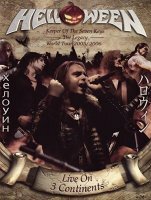 Helloween hit the big-time cross-over jackpot with 'The Keeper Of The Seven Keys' albums back in 1987/88, and when vocalist Michael Kiske left two albums and five years later, being replaced by Pink Cream 69's Andi Deris, the band were always left trying to re-capture that lightning in a bottle. 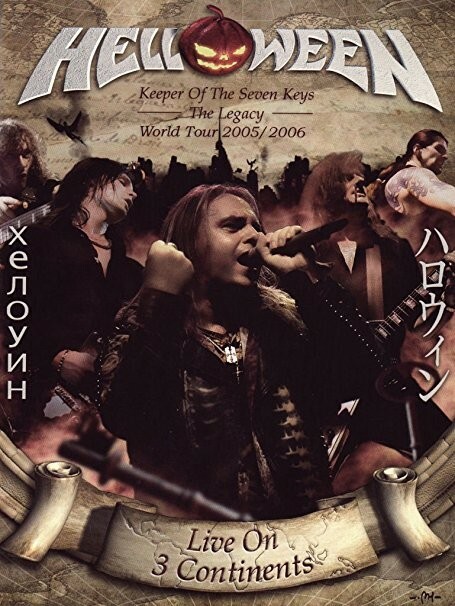 In 2005 the band finally gave in to the many fan requests to do another 'Keeper...' album, the result being 'Keeper Of The Seven Keys: The Legacy', and this is the live DVD/CD release from the resulting world-wide tour undertaken to promote the new album during 2005/2006. Rather disingenuously sub-titled 'Live On 3 Continents', what we basically have here is the full Sao Paulo show from Brazil, South America, with three alternative versions from Sofia (Europe) and two from Tokyo (Asia), not counting the edited drum solo and guitar solo from all three. Now, Helloween are not a small band. In fact, in South America they are rather massive. So there is no excuse for making such a poor quality live DVD. I can't imagine expense was the issue, more likely it was down to simply using a production company who didn't have a clue. There are two main rules when filming for a live DVD... use white spotlights from the rear to light the performers on stage and limit the use of red light. Well, neither rule is followed here resulting in a show that is unbelievably dark most of the time, and frequently bathed in red light – it appears the production crew just turned up and filmed a standard show with absolutely no forethought given to the needs of live concert filming. Indeed, some of the shots from the audience could easily be from today's high quality mobile phones. A totally wasted opportunity! The DVD menus are also poorly designed, and in what I consider an unforgivable "fault", the alternate versions have a pumpkin logo that shows up in the lower left screen for five seconds at the beginning of every chapter – not a problem if the chapters coincide with song starts/finishes, but here the chapters are every sixty to ninety seconds, resulting in this extremely annoying logo popping up on numerous occasions throughout a song. Unbelievable! As for the performance, well, it's Helloween so you know what you are going to get – powerful and exciting twin-guitar Teutonic excellence, with Deris handling the vocals with aplomb. But really, the classic hits such as 'Eagle Fly Free', 'I Want Out', 'Future World' and 'Dr Stein' tend to show up how disappointing the band's latter day song-writing has become, particularly in evidence here during the opening thirteen minute sprawl of 'The King For A 1000 Years' from the '...Legacy' album. A song here and there from 'The Dark Ride', 'Rabbit Don't Come Easy' and 'Time Of The Oath' complement the other new (at the time) '...Legacy' tracks, but for me the magic is missing. The DVD extras disc contains video clips for 'Mrs God' and 'Light The Universe', bonus live clips of 'Occasion Avenue' and 'Halloween', along with an interminably boring forty-nine minute 'Road Trip' movie across all three continents and a slightly more interesting bunch of interviews – if you can be bothered reading sub-titles for forty-four minutes. One interesting quote from Markus Grosskopf comes when he is explaining why they didn't ask any former members to appear on 'Keeper Of The Seven Keys: The Legacy' – "We are not a damn troupe or circus artists", he proclaims indignantly. Well, eleven years later and Kai Hansen and Kiske are indeed joining the current line-up of Helloween for an extensive 'Pumpkins Re-United' world tour. That will certainly be something worth seeing when the circus comes to town, but I sincerely hope if they decide to film this for a DVD release that they at least bring in a professional crew that knows what they are doing!